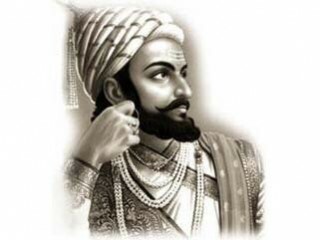 Shivaji Bhonsle (February 19, 1630 – April 3, 1680 ) with the royal title Chatrapati Shivaji Maharaj was a Maratha king who was the founder of the Maratha empire in western India in 1674. Using guerrilla tactics superbly suited to the rugged mountains and valleys found in this region, he annexed a portion of the then dominant Mughal empire and established the seeds of free India which was to endure until 1818. He is still considered a hero in the present-day state of Maharashtra, and stories of his exploits have entered into folklore. Shivaji had a major share in ensuring that India retained her primarily Hindu character. His thoughts and deeds still continue to inspire. Shivaji was born in 1630, in the fort of Shivneri, 40 miles north of Pune. He was one of the most influential amongst the Yadav (Yaduvanshi Kshatriya) rulers. His father, Shahaji, was a jagirdar of the sultan of Bijapur in Pune. His mother was Jijabai.Before Bijapur, Shahaji was a jagirdar of the Nizam of Ahmednagar. After the death Malik Amber, the Vazir, or chief minister, of Ahmednagar, the Mughal emperor Shah Jahan conquered Ahmednagar in 1636. Shahaji then switched allegiance and took refuge under the Adil Shahi of Bijapur. When Shahaji took another wife, as was a common occurrence in aristocratic families, his mother, Jijabai, moved to Pune to raise her son. Shahaji married Tukabai who gave birth to Ekoji, who later founded the kingdom of Tanjore. With the constant mixture of popular lore and genuine history, the understanding of who Shivaji’s influences, mentors and friends were is often uncertain. It is said by many that he was guided in warfare tactics by one Dadoji Konddev, a loyal of the Bhonsale family, until he was eight years old. But the greatest influence on him was of his mother Jijabai who imbibed in Shivaji a spirit of defiance and self assertion. In 1646, when Shivaji was 19, he launched his first military attack by capturing Torna fort, a part of Bijapur territory. In 1647, Shivaji had captured Kondana and Raigarh forts and had complete control of Pune. By 1659, Shivaji had captured some forty forts in the Western Ghats and along the Konkan coast. Afzal Khan, Bijapur’s best general, was sent to destroy Shivaji. Afzal Khan’s campaign was largely successful, and resulted in Shivaji being besieged in the small fort of Pratapgadh near present-day Mahabaleshwar. Shivaji sued for peace, and a meeting was arranged in Afzal Khan’s camp. Each had supposedly dispensed with attendants and weapons. Nevertheless, both men came to the meeting armed. Amongst Shivaji’s hidden arsenal was a small iron finger-grip with four curving razor claws which could be hidden by closing the palm. As the two men hugged each other, Afzal Khan nearly stuck a dagger at ShivajiÃ¢â¬â¢s side, but the Maratha passed his arm around the KhanÃ¢â¬â¢s waist and, to quote from the admiring biography by Jadunath Sarkar, “tore his bowels open with a blow of steel claws”. It is a chilling fact that this episode, in which neither Afzal Khan nor Shivaji appear to have shown much honor, should have been described, amidst the euphoria of the celebrations in 1974-75 to mark the 300th anniversary of the coronation of Shivaji, as the “most glorious event in the history of the Marathas.” (See R. V. Herwadkar, “Historicity of Shivaji-Afzal Khan Confrontation”, in B. K. Apte, ed., Chhatrapati Shivaji: Coronation Tercentenary Commemmoration Volume (Bombay: University of Bombay, 1974-75.) Following Shivajis attack on Khan, Khans private secretary, Krishnaji Bhaskar Kulkarni attacked Shivaji with his sword. But ShivajiÃ¢â¬â¢s bodyguard Jiva Mahale saved Shivaji. In Marathi language people say Ã¢â¬ËHota Jiva Mhanun Wachala ShivaÃ¢â¬â¢ (Because of Jiva; Shivaji survived the attack.) Shivaji slain Krishnaji Bhaskar Kulkarni. Afzal Khan was gutted, and Maratha warriors who had been hiding in the surrounding scrub rushed out and attacked the Bijapur army, taking their stores, treasure, horses and elephants, and enrolled many of his men. Shivaji celebrated his success over Afzal Khan by grabbing more of the Konkan coast between Mumbai and Goa. Shivaji frequently raided to loot and plunder the richer kingdoms surrounding his for wealth, particularly the wealthy trading city of Surat which is in the State of Gujarat now. This led to retaliation from his neighbors, including several Mughal invasions. Very first of was the one led by Shahista Khan, Aurangzeb’s maternal uncle, who managed to seize Pune and the fort of Chakan. In the guise of a marriage party, Shivaji led a small group to a daring attack on the residence of the Khan. According to folklore, the Khan managed to escape with the loss of three fingers, cut off by Shivaji as he jumped out of a window. The last major attack, led by Raja Jai Singh, consisted of fifteen thousand soldiers. Shivaji was outnumbered, and had to submit to Aurangzeb and give Twenty Three of his forts. In 1666, Aurangzeb summoned him, along with his son Sambhaji, who was six years old at the time, to Delhi to talk to him about Maratha defections during his invasion of Bijapur. In Delhi, Aurangzeb made Shivaji stand with the lowly commoners in his court, an intended insult for a ruler like Shivaji. Deeply insulted, Shivaji stormed out of court, and was promptly placed under house arrest. A complex scheme was arranged. Shivaji feigned sickness, and requested to be allowed to have sweets sent to temples in Delhi as an offering. After several days of sending out boxes containing sweets, Shivaji and his son got into two of them, and managed to sneak out without being seen. According to some historians, this was possible only because the guards and some influential officials of the Mughal state were heavily bribed. Smuggled back into Maharashtra, he soon re-established his kingdom and continued attacking Aurangzeb. Notable was the success of the team of ministers he had established before visiting Delhi. Even in his absence, day to day business of the kingdom was run efficiently. In 1674, Shivaji was elevated to kingship in a traditional Hindu coronation ceremony, and took on the title of Chhatrapati, or Holder of the Umbrella (representing the protection he bestowed on his people). After his coronation, he conducted a digvijaya by attacking Mughal encampments in Berar and Khandesh. With his Maratha forces he defeated and captured the forts at Vellore and Jinji in south India. He also signed a friendship treaty with Kutubshah of Hyderabad. Shivaji died in 1680 at Raigad, at the age of fifty because of severe illness. After his death, two of his sons competed for the kingdom and Sambhaji was ultimately crowned king. Aurangzeb’s son, Prince Akbar, rebelled against his father and was sheltered by Shambhaji. The emperor and his entourage moved to the Deccan in 1680 to coordinate attacks against the Mughals. Aurangzeb was never to return to Delhi until his death twenty-seven years later. Shivaji is remembered as a just and wise king and his rule is called one of the six golden pages in Indian history. He established an effective civil and military administration and adopted a policy of religious tolerance to accommodate all religions and sects.Shivaji made it a policy never to desecrate a mosque or seize women. Many Muslims were loyal to him, admired him and served in his army.He also created a government with democratic structure, where 12 ministers were elected by the public – one of the first experiments in democracy in the Indian subcontinent. The chief of ministers (prime minister) was chosen by the public and was called “Peshwa”. He was also only the second king in Indian history to have his own navy. Shivaji was suspicious of the East India Company, and tried to restrict it from establishing its outposts or “Vakhar” in various coastal towns. His navy was built with a long term vision of checking the Company rule and also to keep pressure on the rich areas of Surat. Many Maharashtrians remember Shivaji with admiration (both the Chatrapati Shivaji International Airport and in 1996 the Chatrapati Shivaji Terminus, both located in Mumbai, are named after him). The Mughal rulers against whom he fought utilizing guerilla tactics and clever means to escape from hostile situations, termed him a mountain rat. Shivaji was, in his day, a lone Hindu king fighting for a Hindu kingdom in a land dominated by Muslims. The 300th anniversary of his coronation in 1974 was marked by major celebrations by the state government of Maharashtra, and the government of India. In both his lifetime and decades, even centuries after his death, the famous poets of the Hindu tradition have written odes to his bravery and dharma (sense of duty), making analogies to the birth of the Hindu god Krishna as savior or attempting to establish his close connection to Hindu saints of the era and as a devout follower of Shiva. “Shivaji was not only the maker of the Maratha empire, but also the greatest constructive genius of medieval India. States fall, empires break up, dynasties become extinct, but the memory of a true ‘hero as King’ like Shivaji remains an imperishable historical legacy for an entire human race. The Pillar of people’s hopes. The Centre of a World’s desire to animate the heart, to kindle the imagination and to inspire the brain of succeeding ages to the highest endeavour”. Because of his crusade against an invading power, Shivaji became an icon of freedom fighters (along with the Rani of Jhansi)in the Indian independence struggle that followed two centuries later.His name still carries considerable political clout, and is frequently used by the Shiv Sena, a Maharashtrian Hindu Political party dominant in Mumbai and its surrounding areas. Some of Shivaji’s close associates were also his primary army chieftains, and have entered folklore along with him. These include Baji Pasalkar, Tanaji Malusare, Bajiprabhu, Firangoji Narsala, Murarbaji, Prataprao Gujar, Kanhoji Jedhe, Kondaji Farjand, Kanhoji Angre, Balaji Avaji Chitanis, Netaji Palkar and Lay Patil Koli. View the full website biography of Shivaji Bhonsle.